A drilled shaft is a deep foundation that is set in place by pouring concrete into an auger-drilled hole. Now, consider the structural integrity of one single drilled shaft which supports a bridge or skyscraper and the millions of people that traverse or occupy those structures every day and how crucial it is to the entire structure. That shaft has been designed to support he avy loads and protect its users – if it fails, the structure and the safety of the people using it are compromised. A faster, more accurate verification of the construction quality of such a shaft is now possible through Thermal Integrity Profiling (TIP). Terracon has used TIP to successfully evaluate more than 200 shafts. More than 30 state departments of transportation now recognize the benefits of TIP and are in various stages of adoptingit as an alternative or supplement to traditional Cross Hole Sonic Logging (CSL) testing. TIP methodology measures concrete temperatures during the curing stage. Terracon performs the TIP test by using thermal probes lowered within the CSL access tubes or by using sacrificial wires that are installed vertically along the reinforcing cage. 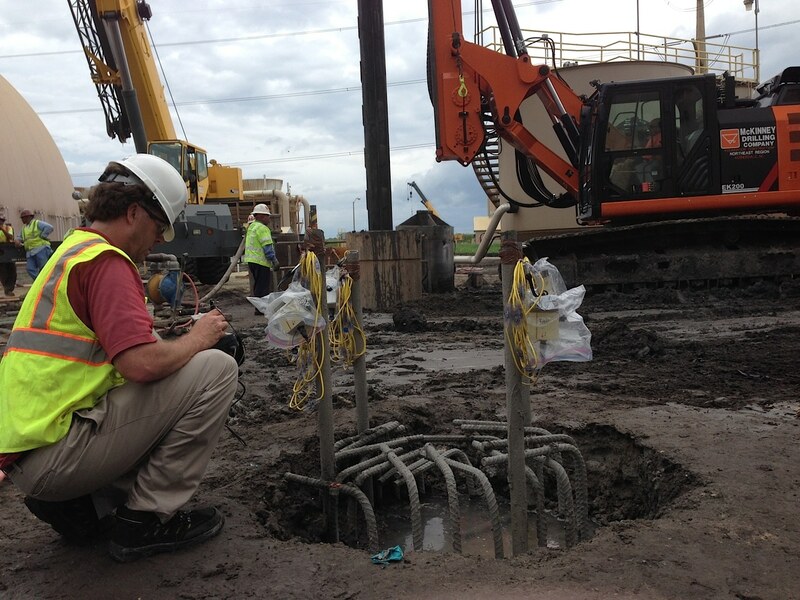 After the concrete has been poured, the wires are connected to data loggers and the information is later retrieved and processed. Either test method can be run and analyzed within 30 hours of the pour allowing for a rapid and detailed evaluation. 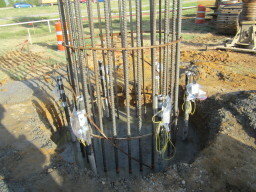 If any detected problem is the result of a particular construction technique, it can be corrected before the next shaft is poured. By comparison, CSL testing transmits sound waves across a concrete-filled shaft using access tubes mounted within the reinforcing cage. However, the wave speeds may be affected by factors such as insufficient curing time or de-bonding of the access tube. If an anomaly (irregularity) is detected, the shaft is typically re-tested after three to seven days to allow for additional curing, or the shaft may be core drilled to collect a sample of the anticipated defect. Each delay can have a significant impact on the construction schedule and often leads to additional costs. TIP can also evaluate the presence of anomalies inside, as well as outside, the reinforcing cage. The amount of concrete cover beyond the reinforcing cage can be calculated, leading to the development of a complete model of the drilled shaft. Research indicates that CSL evaluates between 25 and 75 percent of a shaft’s area (Mullins, 2010; Mullins and Kranc, 2004), with no review of the concrete outside the reinforcing cage. The concrete outside the reinforcing cage is especially critical when considering how it will interact with surrounding soils, from which it derives some of its load carrying capacity and protects the reinforcing steel in corrosive marine environments. In addition to integrity, TIP testing can evaluate the verticality or straightness of the reinforcing cage and create a 3D model of the shaft and concrete cover to show potential necks and bulges in the concrete. Terracon is constantly exploring new technology that will enhance our services and improve our clients’ project experiences. Emerging technologies such as TIP are just one example of how Terracon can bring more accuracy to the construction process, saving clients’ time, money, and peace of mind.